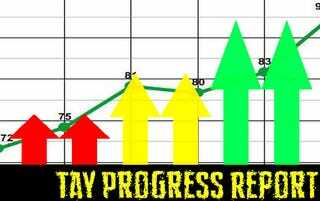 Hello and welcome back to TAY Progress Report, where we all meet our goals, fall in love, and move away to Mexico. Latvia. July 20th 2015 - 1. 45/85 2. Finished. 3. 56/160, added 4, 5. July 27th 2015 - 1. 72/85 2. Finished. 3. 56/160, 4. Organized! Implementing next week. 5. Finished! July 20th 2015 - 1, 2. Second to final chapter of Tales of Grace f and abyss. Added 5, 6. July 20th 2015 - ??? July 20th 2015 1. So far so good! 2. FFVI image almost done 3. Close to finishing Ar Tonelico II 4. contract and tax permit out, passport printed, calling around for places to have business cards and posters done. July 27th 2015 - 1. Progressing, slowly. 2. Finished, but now going for 100% completion 3. Recipe picked, need ideas for game. July 27th 2015 - 1. Second down! 2. Gwent is dominated. 3. Sunday Sunday Sunday! 4. No progress 5. No progress. July 20th 2015 1. Gettin’ ideas 2. Sort of 3. Almost done! 1. One down 2. Bought Fabric, sized client 3. Bought Fabric 4. Added Side buckles 5. Done! 6. Up to Sewing Step 7. I will make a wonderful cosplay outfit for Aikage because he’s such a nice guy.